I’m not really sure what to make of this. 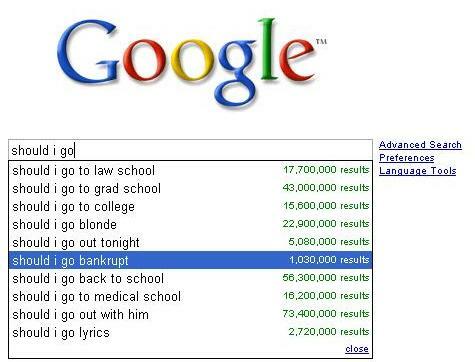 There are 17 million results for “should I go to law school?” and only 1 million for “should I go bankrupt?” “Should I go blonde” has more results than those two trifling issues combined. I do like that “should I go out with him” has as many results as “should I go to (1) law school (2) medical school and (3) grad school” combined.